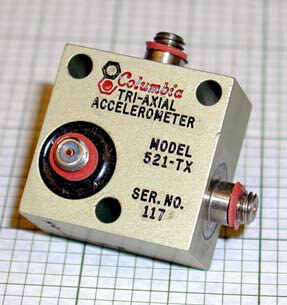 The Model 521TX Triaxial Piezoelectric Accelerometer consists of three mediumsensitivity piezoelectric accelerometer elements orthogonally mounted in a machined anodized aluminum block. The unit is designed for medium level shock and vibration measurement work where a three-dimensional characterization of dynamic responses of a structure is required. The unique design of the piezoelectric seismic system ensures that the sensor has no discernible spurious response to mounting torque, body strains, cable vibration, cable whip, pressure variations and most heat transients. The electrical isolation provided by the epoxy bonding permits accurate, repeatable measurements even in noisy industrial environments. The Model 521TX-HT is a high temperature version that will operate in environments up to +500 Deg. F. The units can be screw or adhesive mounted.